I can't say I've considered light bulbs for our new home, but we all know they can matter quite a bit in how a room feels (at least subconsciously). I kind of figured we'd go with newer compact fluorescents since they save energy and last MUCH longer than regular incandescent bulbs (I'm partial to the latter; I HATE to change light bulbs, especially when one is going out somewhere in the house just about every week). But, looks like one should be careful in choosing compact fluorescents for lighting, lest you give your home the feel of a sterile hospital ward or a government office building. 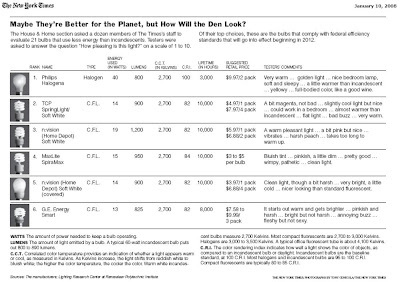 Check out this article in the New York Times, if you are interested in compact fluorescent lighting. 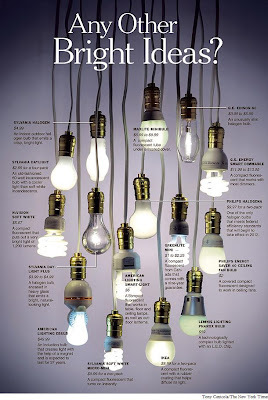 They tested at least 15 different light bulbs (see below), with interesting results. Most compact fluorescents are very poor in terms of meeting the innate human need to feel warm and comfortable in our homes. I always find it fascinating how something so seemingly unimportant as differences in light color and feel can have such an affect on our mood. One thing's for sure, if we're going to build an architecturally designed home we might as well not screw up the feel of it with bad light bulbs. Every little thing counts in good design. We have experimented with compact fluorescent lightbulbs. One frustrating thing we have found is that in some locations in the house they seem to work great, but in other places they burn out really quickly, plus you have to recycle them specially because of mercury levels. My husband is ready to go back to incandescent, but I like the idea of using less energy. Has anyone else had simlar experiences? That's odd that you get quick burn out on CF bulbs, they're supposed to last at least 2 years. Maybe you should try the inductive bulb. It's the really weird looking one in the bottom left with the blue glow and the induction coil coming out of it (ask your husband, he'll know :-). It lasts for 37 years! It's $50 for one though. Also, I've heard that in order to make the bulb more efficient(CF), it should be on for 15minutes before you shut it off. With the way we were trained to turn lights out the minute we leave a room...Oh well, I heard that on the radio just the other day, so I don't know if it's true or not! Vocations awareness week is Jan. 13-18!